Well, I’ve been quiet lately, working hard. For various reasons the weaving class is now very small – just 3 of us. Liz and the guild have been generous to keep us going, but something has to give. So we’ll be joining the Wednesday night second year class and for a few weeks at least also meeting on our normal Tuesday night, trying to cover the bare essentials of the last half of first year and first half of second year. So that’s two looms working – double weave for Tuesday and threading up an 8 shaft twill sampler for Wednesday. Plus I’ve warped up the big loom for Geoff’s scarf and done a sample of various wefts. My biggest, hardest lesson the last couple of weeks – no matter how keen I am, no matter how much I want to finish the next little bit, no matter how careful I think I’m being, I need to STOP when tired. Then after a break I need to DOUBLE-CHECK that I am restarting in exactly the right place. This is so, so frustrating. I started threading the twill sampler tonight, I have to wait up until my son phones to collect him from a party, and I must not touch the loom. It’s sitting on the table, calling to me… but there is no point when I’d just have to fix all the mistakes in the morning (that’s if I find them all). 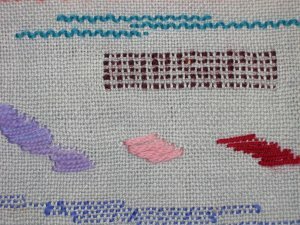 To stay productive while not creating a huge headache of a mess on the threading I have been sorting out photos of the last class sampler – a mix of lace and embroidery and finger-manipulated weaves. (apologies for rotten colour). 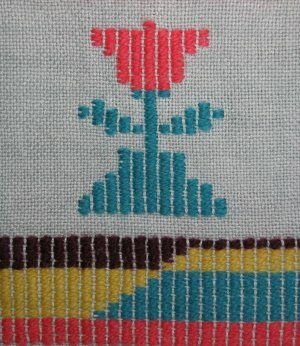 Leno involves using a pickup stick to create crossed over warp ends. 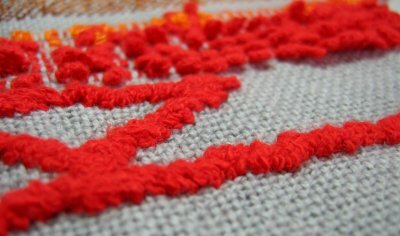 The weft holds the twist in place. This lets you create a gauzy effect while still being reasonably stable. Practice should definitely help build some speed. It felt like every row took 5 minutes – and a moment’s clumsiness meant starting over. Still, some of the results were really nice and in the right place would make a very pretty detail. I didn’t do much Brooks bouquet. 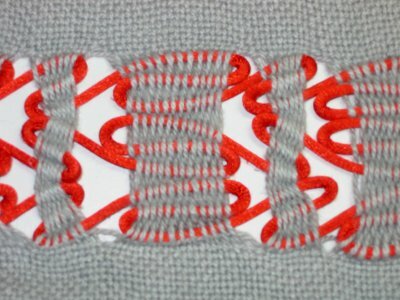 This is a wrapping technique, a bit like backstitch, pulling the warp together in little bundles. 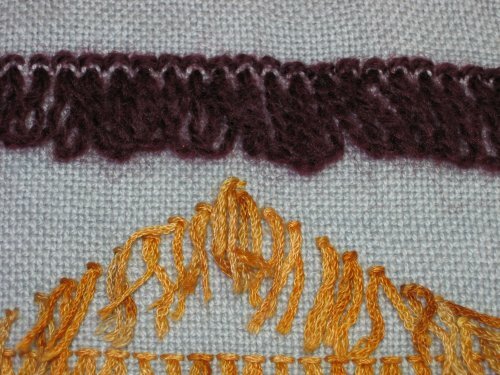 I kept with the main colour, but it can look good using a contrast weft too. Like all the other techniques we tried, we only scratched the surface of what can be done with danish medallions. 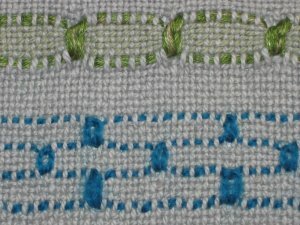 This involves using a contrast yarn to weave one pick of weft. A little later in the weaving you use the contrast again, this time working with a crochet hook to pull a loop of yarn up. You can snug the loop up a bit to encourage the medallion shape. We tried a few different things with inlay. This is basically some extra weft that you insert to create pattern. I particularly like the meandering line (at the bottom on the photo) and the wavy line (at the top). 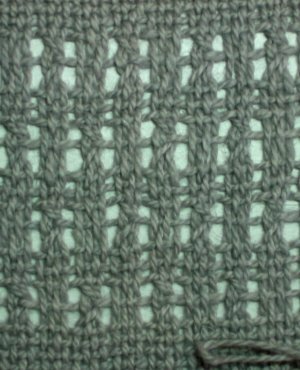 The meander you get by taking a contrast yarn for a wander with a row of the ground weft between each row of contrast. For the wavy line, do two rows of the contrast without anything between. I found that the yarn you use for the inlay makes a huge difference. Also if you need something thicker you get better coverage by using a number of strands of thin yarn rather than one strand of thicker yarn. 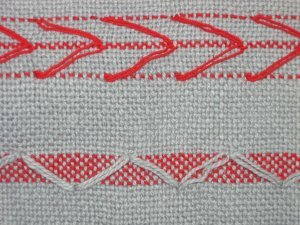 The three experiments in the middle look like messy satin stitch embroidery, but are actually firmly anchored in the weave in the back. I enjoyed the dukagang, which is a particular type of inlay. 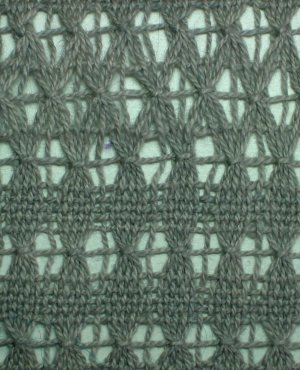 I was using borg sn2 wool which sat and covered very nicely (the base warp and weft is cottolin). 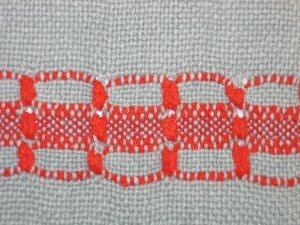 The contrast yarn floats over 3 ends then is tied down by the fourth. I think it would wear very well as a sturdy bag. [Parent taxi service update… Geoff has gone to collect the party-goer, so I may be able to finish this post tonight]. Spanish lace was rather tricky. You need just the right yarn to get good movement. I haven’t shown a couple of examples that were a bit of a non-event. The one here is at the other extreme – I was determined to get it to show, so used a thick, shiny, non-compressible and very red cord. It’s also a bit unstable. 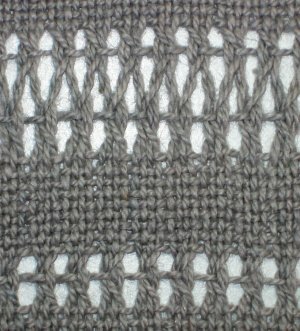 You basically do some plain weave in sections of the warp. Some movement could be seen even when it was on the loom, and a lot more appeared when I did the wet finishing. I think there’s room for a lot more experimentation, but it’s not one of my favourite effects. Ghiordes knot is also called rya and turkish knot and uses a larks head knot. I tried two variations. First I outlined a shape using knots of pre-cut yarn. It felt very awkward, but I’m sure that as usual practice would make a big difference. The second experiment was a continuous loop, using some dowel to keep the loops a consistent size. I really like the neat little zigzag at the top where the loops are anchored. Of course you could do both types much more densely, moving towards a rug effect, but I think the highlight effect could also be useful. [The boys just arrived safely – fortunately I’m at the last photos]. The strong line (it’s actually a triangle and a line) is soumak, in more bright red. Then we have some red loops (aka bouttone), formed over knitting needle and placed in varying density. 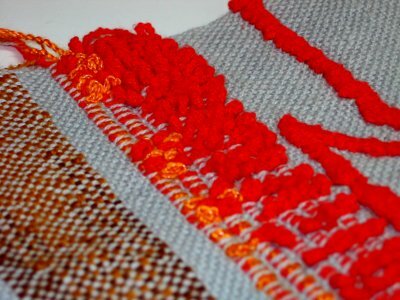 The mix of red and orange is spanish loops – the same idea, but using two different contrast wefts in combination. There’s also some clasped weft visible, but you’ll get much better information on that from Kaz.